Influenza (or Flu) is an easily spread infectious disease. Children under age 2 have a higher risk of developing complications if they get the flu. The information in this article has been put together to help you protect children under age 2 from the flu. This is not a substitute for medical advice from your health care provider. If you think your baby may have the flu, you should contact a health care provider right away. Oseltamivir (Tamiflu) in liquid form will likely be used. Although this drug is not approved for use in children younger than 1 year of age, serious side effects are quite rare. After talking about the risk of side effects against the possible complications of the flu in your baby, you and your health care provider may decide to use this medicine to treat the flu. Paracetamol, Ibuprofen or Acetaminophen (Tylenol) help lower fever in children. Sometimes, your health care provider will tell you to use both types of medicine. Always check with your health care provider before giving any cold medicines to your infant or toddler. • Your child will need a second flu vaccine around 4 weeks after receiving the vaccine for the first time. • There are two types of flu vaccine. One is given as a shot, and the other is sprayed into your child's nose. You or your baby cannot get flu from vaccine. Some children may get a low-grade fever for a day or two after the shot. If more severe symptoms develop or they last for more than 2 days, you should call your health care provider. However, all of the routine vaccines are also available without added thimerosal. Ask your health care provider if they offer this type of vaccine. • Cover your nose and mouth with a tissue when you cough or sneeze. Throw the tissue away after using it. • Wash your hands often with soap and water for 15 to 20 seconds, especially after you cough or sneeze. You may also use alcohol-based hand cleaners. If your baby is younger than 6 months old and has close contact with someone with the flu, inform your health care provider. 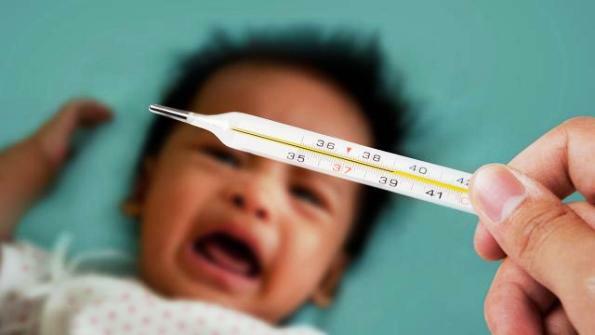 • Your child does not act alert or more comfortable when the fever goes down. • Fever and flu symptoms come back after they have gone away. • The child does not have tears when crying. • The child's diapers are not wet, or the child has not urinated for the last 8 hours.